Digital Theory by ETron Circuit Labs is Electronic Education Curriculum designed for the 21st century student. This fully interactive guide is ready to take your technology program to the next level. Digital Theory is fully backwards compatible with Tron.ix 2 and Mr. Circuit 2 courses. In this Lab you will lean what Digital Electronics means. The digit part of the Digital is referring to a Binary digit. In the Binary numbering system there are only two digits, 1 and 0. The 1 means ON, and 0 mean OFF. As a result the inputs and outputs of a Digital Circuit are either ON or OFF. As you build on what was learned in Lesson 2, a Digital Circuit is one that is either ON or OFF. In other words, a Digital Circuit’s output is either HI or LO. When a Digital Circuit is ON (switch closed), it is putting out a voltage at its maximum capacity. This voltage is called a HI. Conversely, when a Digital Circuit is OFF (switch open), it is putting out no voltage. This no voltage condition is called LO. The voltage of HI can also be called 1 and LO can be called 0. You will be assembling all the Digital experiments in this manual on a Solderless Circuit Board similar to the one that you used in The Basics by ETron Circuit Labs. However the Solderless Circuit Board that will be used is slightly different it has more groups of 5 holes and additional buss strips along both edges. In Digital Theory you will learn to use many different Integrated Circuits to help complete the Labs. This page has all the schematic symbols for Integrated Circuits you will be using. It is a great reference tool and you should refer back to this page often to help you fully understand and learn the different concepts being taught throughout this manual. In Labs 1 - 30 you will be introduced to Combinational Logic. Logic Gates are the basic building blocks which are described by Truth Tables and Boolean Algebra. 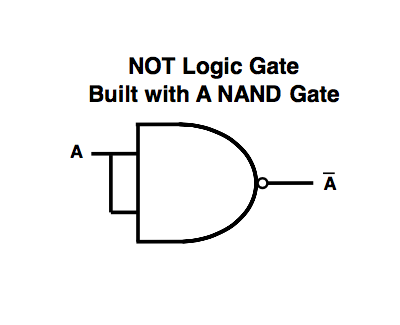 Logic Gates discussed in this manual include AND, OR, NOT, NOR and NAND. In Labs 31 - 35 you will be introduced to Sequential Logic where the basic building blocks are Flip-Flops which are described by Truth Tables and Diagrams. In this Lab you will build an LED Logic Indicator Circuit. A Logic Indicator is used to show the output of a Logic Circuit. If the output of a Logic Circuit is HI, this Logic Indicator will light up the LED. In this Lab you will build an AND Logic Gate Circuit. An AND Logic Gate is a device that will output a Logic State of HI only if both of its inputs have a Logic States of HI. In this Lab you will build an OR Logic Gate Circuit. The OR Logic Gate is a device that will output the Logic State of HI if either one or both of its inputs have Logic States of HI. If both inputs are LO, the output will be LO. In this Lab you will build a NOT & YES Logic Circuit. In the true sense of the word, the NOT and YES Circuits are not Gates because they only have one input instead of two. But, they are still generally referred to as Gates. The NOT Logic Circuit is a device that will output a Logic State of HI if its input is a Logic State of LO. Conversely, it puts out a Logic State of LO if its input is a Logic State of HI. In this Lab you will build a NOR Logic Gate Circuit. The NOR Logic Gate is a device that will output a Logic State of LO if either one or both of its inputs have Logic States of HI. If both inputs are LO, the output will be HI. In this Lab you will build a NAND Logic Gate Circuit. The NAND Logic Gate is a device that will output a Logic State opposite of that of the AND Logic Gate. A NAND Logic Gate will output a LO only if both inputs are HI. LAB 7 - 2 NAND Logic Gate “Clock"
In this Lab you will build a Clock Circuit by using 2 NAND Logic Gates that will emits pulses at a regular rate with varying frequencies. LAB 8 - NAND Logic Gate “Timer"
In this Lab you will build a Timer Circuit by using a NAND Logic Gate that will allow you to vary the time the LED is lit by changing the value of the capacitor. In this Lab you will build Memory (R-S Flip-Flop) Circuit by using 2 NAND Logic Gates that will allow you to observe the Circuit with two stable states upon the reversal of the inputs. In this Lab you will learn about the 555 Timer IC and build a Circuit that will generate Clock pulses. The 555 Timer IC has many purposes. It was designed to be used either as a Clock (Astable Multivibrator), a Timer (Monostable Multivibrator) or a Flip-Flop (Bistable Multivibrator). The 555 Timer IC puts out a square wave of adjustable duty-cycle. In this Lab you will build a Binary Counter Circuit that will count from 0000 to 1111. In other words, it will count from 0 to 15, decimal. In this Lab you will build a Decade Counter Circuit that will count from 0000 to 1001. In other words, it will count from 0 to 9, decimal. This kind of counter is called a Decade Counter. In this Lab you will learn about Digital Readout LED Display and build a Seven-Segment LED display Circuit that uses both common-anode and common-cathode. You will light up each segment and see how they display decimal numbers. In this Lab you will build a Digital Readout Decoder Circuit and further develop the concepts learned from prior Labs on how a segment of a Seven-Segment LED is lit. In this Lab you will build a Digital Counter Circuit with a Seven-Segment display. You will use the 555 Timer IC wired as an Astable Multivibrator Circuit to input pulses to cause the counter to count. In this Lab you will build a Digital Up or Down Counter Circuit with a Seven-Segment display. You will use the 555 Timer IC wired as an Astable Multivibrator Circuit that uses input pulses to cause the counter to count. In this Lab you will build an 8-Output Demultiplexer Circuit and use a 4051B 1-8 Switch Multiplexer/Demultiplexer IC as a Multiplexing and Demultiplexing. In this Lab you will build a Digital Up/Down Chasing Lights Circuit. The Chasing Lights Circuit is called a “chasing light” Circuit because the LEDs will light up sequentially making it appear as though each light is chasing the next. In this Lab you will build a visual Logic Probe Circuit. Logic Probes are used extensively in Digital Electronics to trace the signal through a Circuit. In this Lab you will build a Touch Activated Pulse Generator Circuit which can also be referred to as a One-Shot Pulse Generator Circuit. When your finger touches the input wires to the 555 Timer IC, a pulse will be generated for a period of time. When the pulse ends, you may touch your finger to the input again and it will emit another pulse. In this Lab you will build a Pulse Train Generator Circuit using a 555 Timer IC. The length of time the pulse train lasts and the frequency of the pulses can be varied by changing the values of the resistors and capacitors. This type of Circuit is used in a variety of Digital devices. In this Lab you will build a random game of chance that will give you a 50/50 probability. The Yes/No Decision Maker Circuit will use a 555 Timer IC as a Clock to generate input pulses to a 4029B Up Down Div/10 IC. In this Lab you will build a random game of chance that will give you a 25% chance for Yes, a 25% chance for No and a 50% chance for Maybe. In this Lab you will build a Stop-Action Timing Circuit using a 555 Timer IC as a Clock to generate a one-tenth of a second pulse every two seconds. In this Lab you will build a Digital Touch-Activated Switch Circuit using a 555 Timer IC as a Mono- Stable Multivibrator to generate a pulse. This pulse will be sent to the 4029B Up Down Div/10 IC and the output from the Q0 will connected to a LED. The LED will turn on and off as you touch the contacts. Using the Parts Inventory as shown in the “Here’s What You’ll Need” section, place each electronic component needed for this experiment on its corresponding drawing. Observe the schematic symbol for each component. In this Lab you will build a Digital Light-Activated Counter Circuit that is commonly called a Photo- Electric Counter. Each time light hits and passes the photocell, the Circuit counts. This type of counter is used commercially to count people, objects, etc. In this Lab you will build a Winning Number Generator Circuit by using a Clock Circuit feeding a Decade counter connected to a Seven- Segment Decoder and display. In this Lab you will build a 1-6 Number Generator Circuit using a Clock Circuit feeding a Decade counter wired a special way with a 3-input AND Gate and then connected to a Seven-Segment Decoder and display. This Circuit acts as a single Dice like you’d find in a Dice game. The Circuit will give you one of six numbers, just like the numbers on dice. In this Lab you will build a D Flip-Flop Circuit using a 4013B Dual D Flip-Flop IC working as a D Flip-Flop. 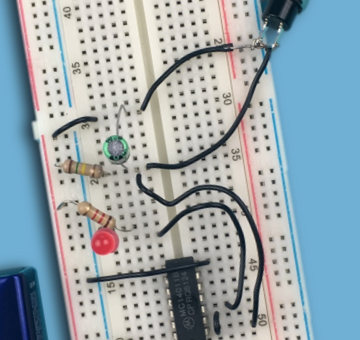 The Circuit will wait for the Clock pulse to change the output states depending on the input to pin 5, or D.
In this Lab you will build a J-K Flip-Flop Circuit by using two J-K Flip-Flops to build a Binary Divider Circuit. The J-K Flip-Flop is referred to as the Universal Flip-Flop because you can make all the other Flip-Flops from it. In this Lab you will build a Schmitt Trigger Circuit and be able to verify the input voltage as well as discover the hysteresis or Dead Band. A Schmitt Trigger is a Bistable Circuit driven by a variable wave input. The important characteristic is that it snaps to a HI or a LO, giving a sharp square- wave output. 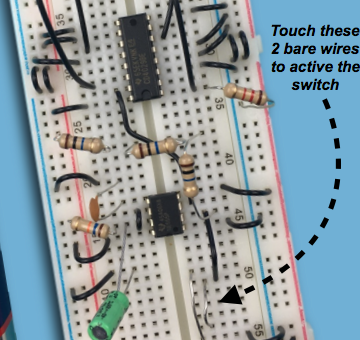 In this Lab you will build a Shift Register Circuit. A Shift Register is a device that temporarily stores information and shifts it to the next readout when new information comes in. Like a calculator moves a number over in the display each time you press another number on the keypad, a Shift Register moves binary data from one LED to the next. In this Lab you will build an Operational Amplifier (Op-Amp) Circuit that will be wired in three modes and verify their operation with a meter.